For Tyson Fury, beating Deontay Wilder symbolises the culmination of an audacious and unlikely comeback after two and a half years out of the ring following his win over Wladimir Klitschko. Yet, despite taking on the WBC world heavyweight champion in just his third outing since besting Dr Steelhammer, and his first against an opposition of a high standard, Fury is nowhere near as much of a betting underdog for victory at the Staples Center as he was before outpointing Klitschko. Wilder, or the Bronze Bomber as the man himself describes his in-ring alter-ego, is currently trading at odds of 8/13 to win, while the Gypsy King, the division’s lineal world champion, can be backed at a 13/10 pick. As far as our Wilder vs Fury predictions are concerned, this amounts to evidence that the William Hill traders strongly suspect the 6’9” switch-hitter can make light of his long time out and glorified sparring session prep matches to return to the big time at the same level which he left it. Why not check out our boxing betting guide? Counterintuitively for a world heavyweight champion that blazed his path to the top of the sport courtesy of a 40-man trail of, in all but one case, knockouts, Wilder has arrived at this moment in an oddly low-key fashion. Just one of his seven world-title level opponents had won a fight of that ilk previously and that man, Bermane Stiverne, won his title before losing it to the Alabama native on his very next outing. Wilder’s most recent bout, against Luis Ortiz, was arguably his toughest to date and although he landed the ‘to win by KO, TKO or DQ’ odds on that occasion, he displayed more than enough in terms of weakness to suggest that an on-point Fury can rewards underdog backers in the bout betting. The boxing smarts of Ortiz caused the Bronze Bomber all manner of problems, winning him at least four stanzas on all three scorecards and the powerful Cuban came close to avenging the fifth-round knockdown he suffered in a pulsating seventh. Even after Wilder’s trademark power came through for him as the challenger gassed out in the 10th, he was just one point ahead on the final scorecards. Three years back, the Gypsy King bamboozled a far better technician in Klitschko the younger and his magic box of feints, tricks, slips and stance-switches represent a significant step up on anything Deontay has had to try and chase down previously. 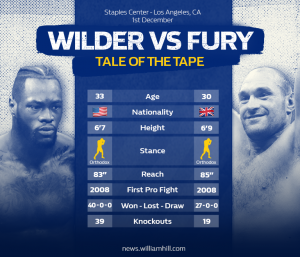 Our Wilder vs Fury predictions tips the challenger to be extremely elusive against the WBC boss, who could well be outclassed if turning up in the same kind of wild-swinging form he produced against Ortiz. The Fury to win odds are substantial enough to be an attractive bet on this basis, without us even having to look to the method of victory betting for greater potential rewards. Wilder to win by KO, TKO or DQ has copped in all bar one of his 40 professional dances to date and, if he is to prevail against the technically superior Fury, it seems like taking the 6/5 pick about him ending it inside the distance makes more sense than the straight win bet forecast at 8/13. However, in bewildering Klitschko in Dusseldorf, the Briton had no great interest in going for the KO, preferring to let his skills talk at greater length and, with the Bronze Bomber showing durability of his own against Ortiz, it’s tempting to foresee this bout playing out in a similar fashion. William Hill are currently offering Fury to win on points with the odds tipped at 21/10, but, at 5/1, backing a victory for the lineal boss by way of stoppage has plenty of appeal, with his power being underestimated. There’s more than one way to skin the proverbial feline and despite a moderate 19 stoppage wins from his 27 fights to date, five of the towering traveller’s last seven wins have come inside the distance. Indeed, like a heavyweight Vasyl ‘no-mas-chenko’ Lomachenko, three of his last five opponents have checked out on their stools between rounds. 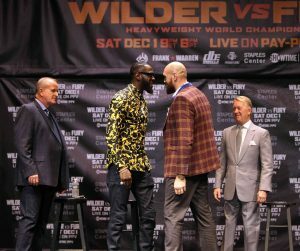 Should an outclassed Wilder find himself getting wilder and wilder, Fury’s not inconsiderable power could come into play.